When my son first started developing the headaches, we thought he had a tumour. We were just so scared. He had CT scans and everything and it was all clear. Then we started looking into impacts of coal seam gas development as they had just started drilling in our area and - the headaches, the nosebleeds, skin rashes that some people in the area have - it's all consistent with what other people are experiencing. We know a local lady who lives within 200 metres of a gas well. She and her son both became quite ill - they were even passing out. Her young son's the same age as my boy and he was bleeding from the nose as well as the ears. This got us thinking as well as researching the impacts, because it was at the same time as coal seam gas came to our town, Tara. It's just scary. A lot of people won't come forward because they're worried about repercussions from the people working in the industry, so they wont speak out. I've written letters, I've told the Premier personally -- they are all not interested. There are too few of us here to get the Government's attention. Together, we can show the Government that people right across the country are appalled by the impacts of coal seam gas. That's why I'm asking for your help. 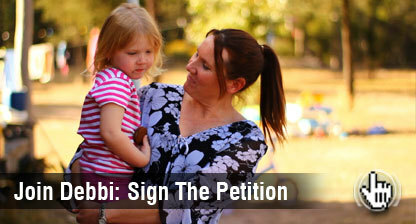 Please join me and other locals in signing this petition to tell the government to stop this industry, stop it now - you can't replace people, don't let my kids and other families get sick. In the past 2 years the industry has drilled 11 gas wells within 3 kilometers of our house. They plan to turn our area into a fully developed gas field - thousands of wells, spread across the area 750 meters apart. It could happen anywhere: coal seam gas reserves have been found right across the country and the industry is moving in at a breakneck pace. When they are drilling, we can't sleep. You can hear the droning of the drill rig from inside my home over the sound of my five noisy children. When they drill, there is a sulphury-rotten egg smell in the air and sometimes you get a metallic taste in your mouth. Coal seam gas mining has already made our property unsellable. Nobody wants to live in a gas field. I don’t want to live in a gas field. We believe this industry needs to be stopped. We'll do whatever it takes to stop it but we need your help. As frightening as this is, coal seam gas mining doesn't just pose a threat to people's health. It is damaging water supplies, jeopardising agriculture and food production. It is an industry out of control, that the government won't stand up to unless they hear from us. We won't stand by and allow people's health to be threatened, watch our farmland be eroded away and the country's precious aquifers permanently damaged. You can help Debbie and her Family by clicking this link.